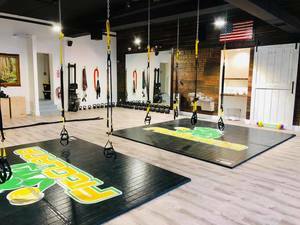 Three questions with Sander Vanacker, owner of FitGuana. I started FitGuana because I was anxious to have a physical gym again after doing personal training and online coaching for the last few years. We were waiting for the right opportunity until we found the space at the old Press Building. My training style relates best with dynamic individuals or groups who like to push themselves while using functional (and sometimes uncommon) equipment. This enables us to offer very creative and engaging sessions for our private sessions as well as group classes. Fitness is one of my passions and I thoroughly enjoy training alongside my clients. This makes it a lot of fun and motivating for everyone and the high training load makes me able to reach my own training goals. Our best selling service by far is our High-Intensity Group Training sessions. It is amazing how many people are willing to get stronger, leaner, fitter and healthier but achieving a certain level of intensity and diversity in training is difficult to do solo. That is why our group sessions are the most popular. People get pushed within their own personal abilities, with safety as a top priority, and the group dynamic increases the motivation and drives to work. It’s pretty amazing to see how quickly people progress in this type of setup! How many local businesses do you use to support your business (products and services) and can you name them? While we were constructing our new gym, we used as many local companies as we could. We used Kendall Electric, Turner Mechanical, Sunburst Plumbing and Bring Back Nature for our custom live edge woodwork. We purchased all our windows and doors from the Ridgefield Building Supply and had a 3D Tour done of our facility by My3DBizTours.com, also a Ridgefield company. We are always open to working with other Ridgefield businesses for both future projects as well as collaborations. We are working on a few right now, stay tuned! FitGuana is located at 16 Bailey Ave. Visit them online here. FitGuana tags Julie Kate Studios.